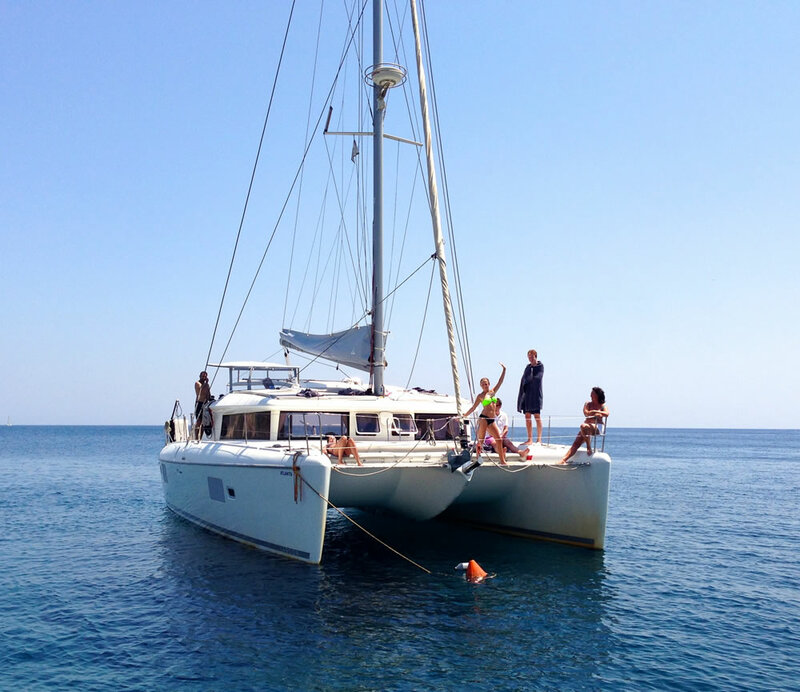 Our Day Cruise begins with a stop at the Red Beach to enjoy a refreshing swim. 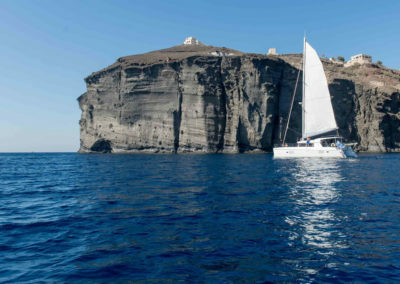 We continue with a pleasant sail along the White Beach, the Black Mountain and the big Light House, south of the Caldera. 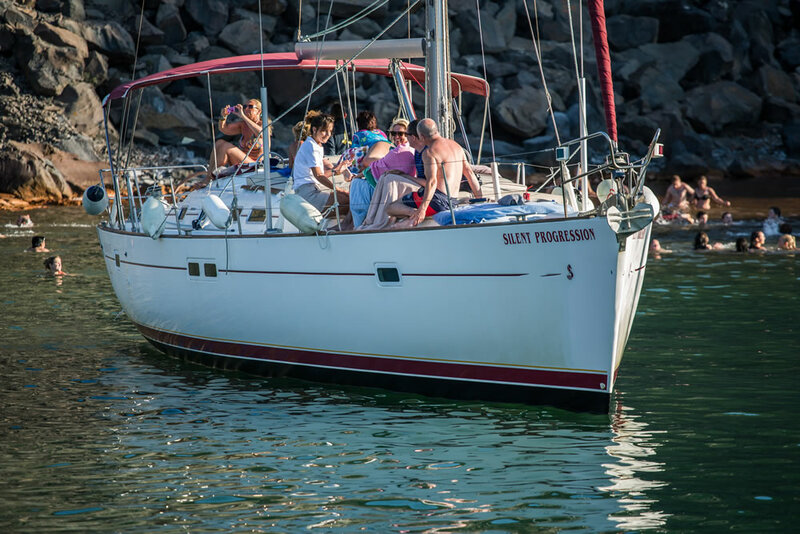 You can explore the unmanned volcanic beaches where the spectacular colors which will amaze you or you can just sunbath on the deck. 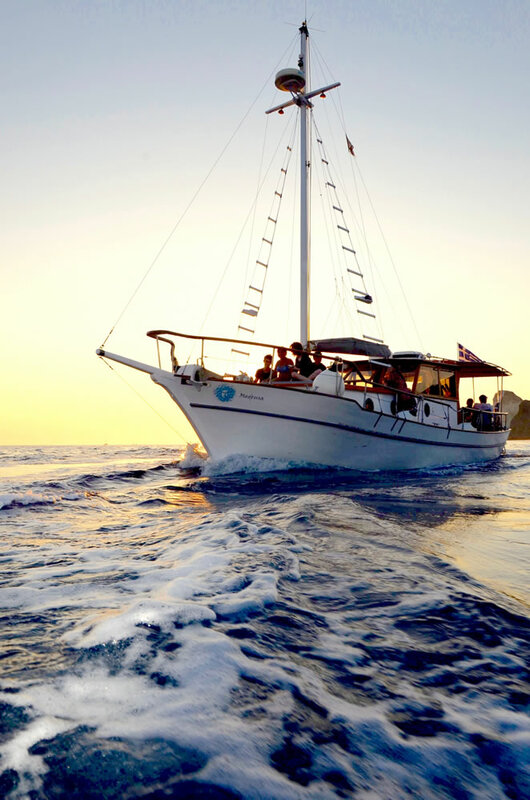 Whilst heading to the Hot Springs, you will feel the energy of the Volcano and the spirit of the island. 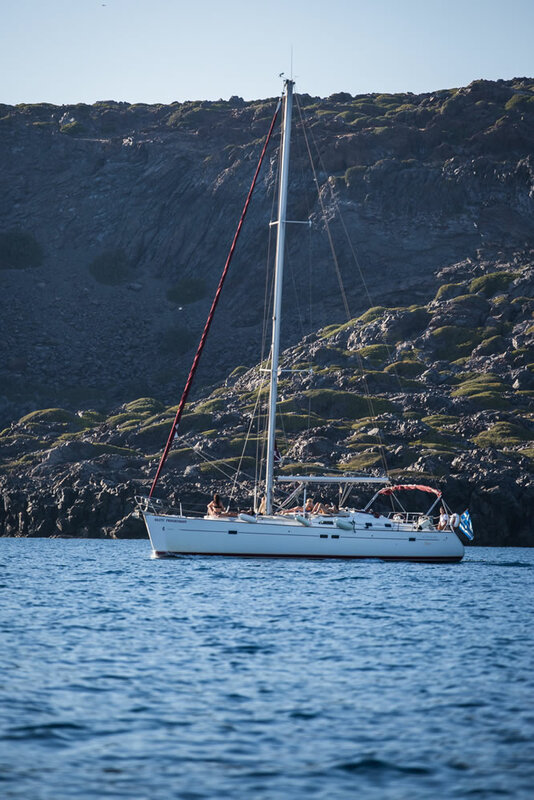 Our next stop is Thirassia Island, a fishermen’ s island, which is ideal for swimming and admiring the unique view of Manolas village, just before we enter the old port of Ammoudi. 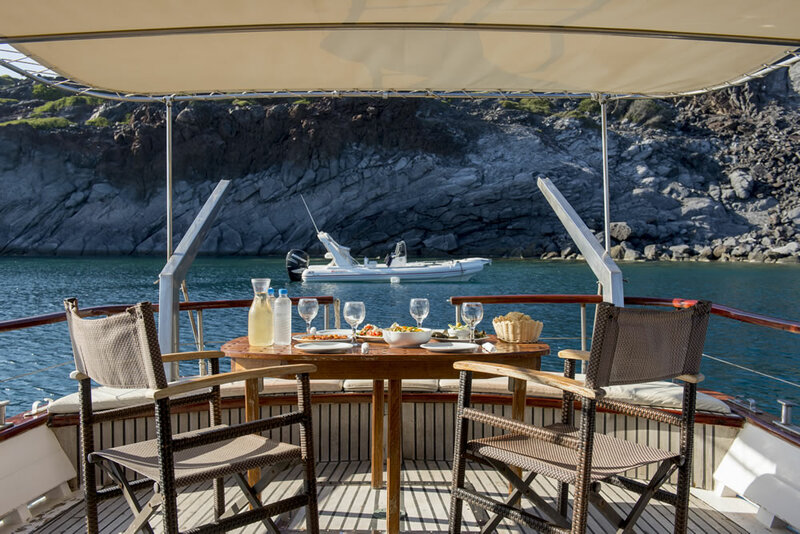 A delicious lunch with wine and dessert is served onboard. 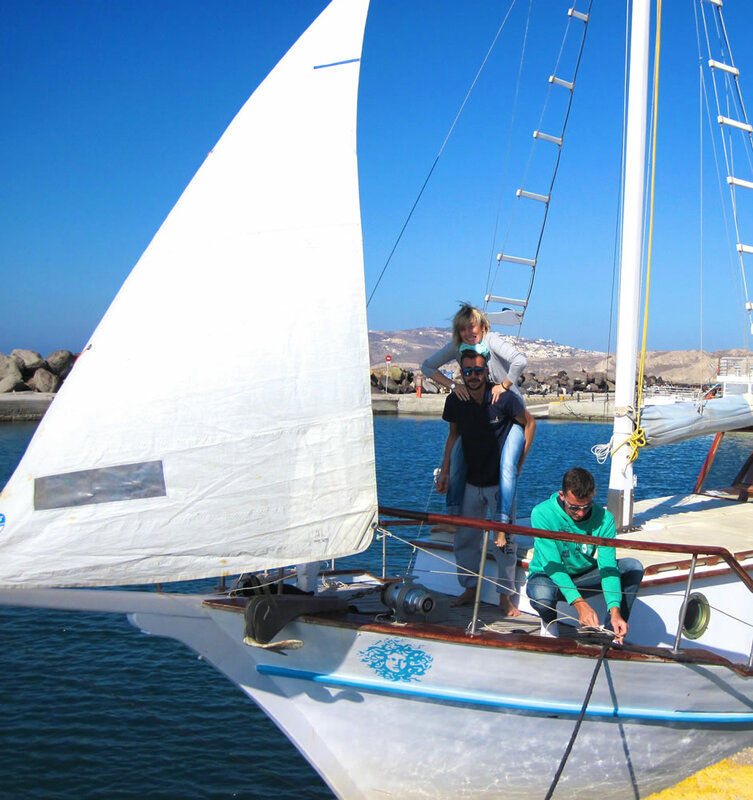 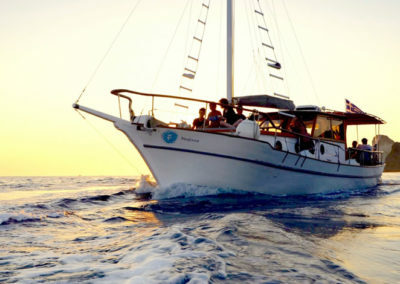 The Sunset Cruise starts from old port Ammoudi and a visit to Thirassia island. 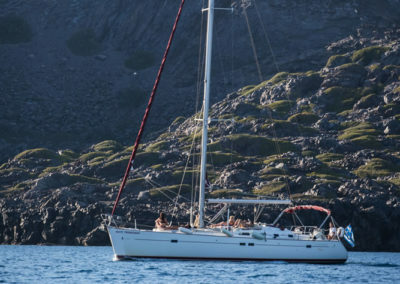 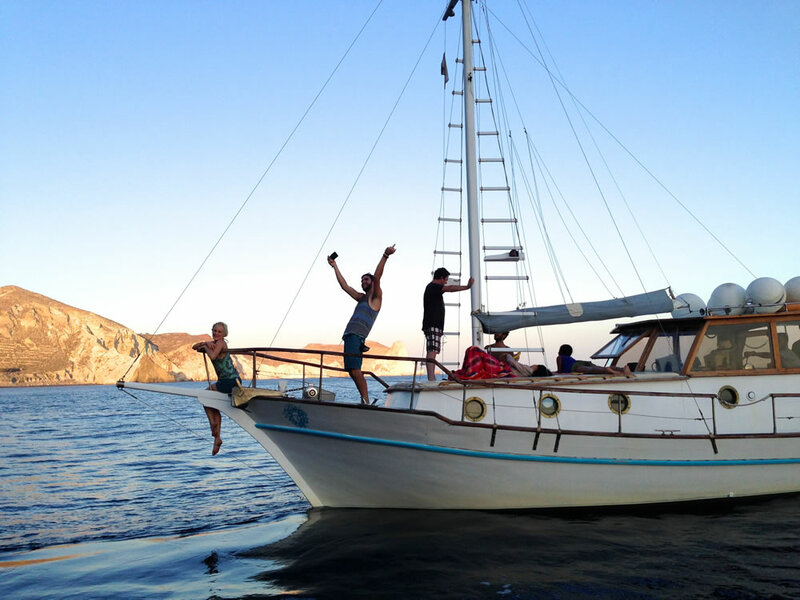 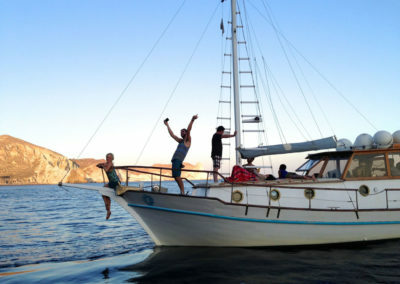 Then we sail to Palea Kameni for a swim at the famous Hot Springs, the Volcano for snorkeling or swimming, the Black Rock of the Indian, the White Beach and the Red Beach. 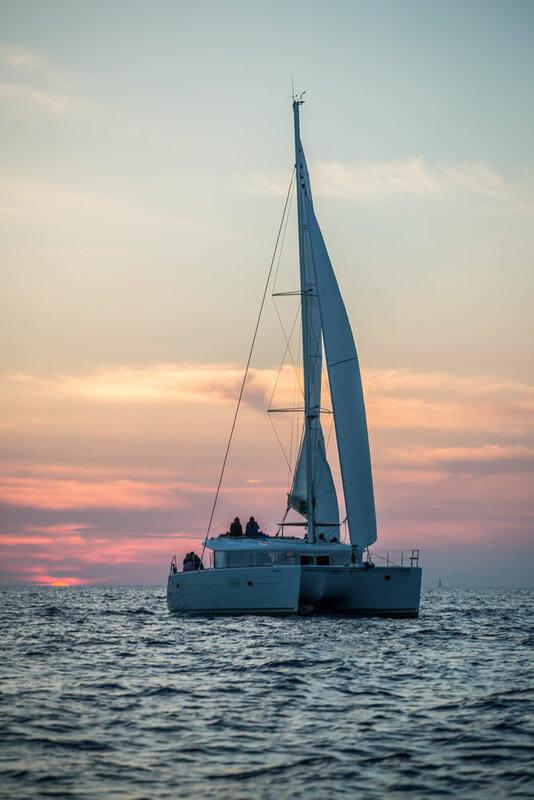 While sailing along our beautiful coastline, you will be left breathless as you admire the unique Caldera and the spectacular colors of the world’s famous Santorinean sunset before we enter the port of Vlihada. 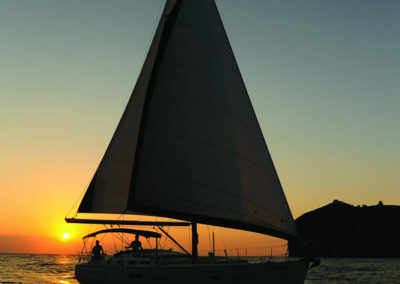 As the night falls, a sumptuous dinner is served complete with wine and dessert. 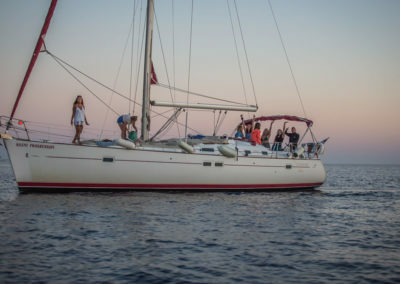 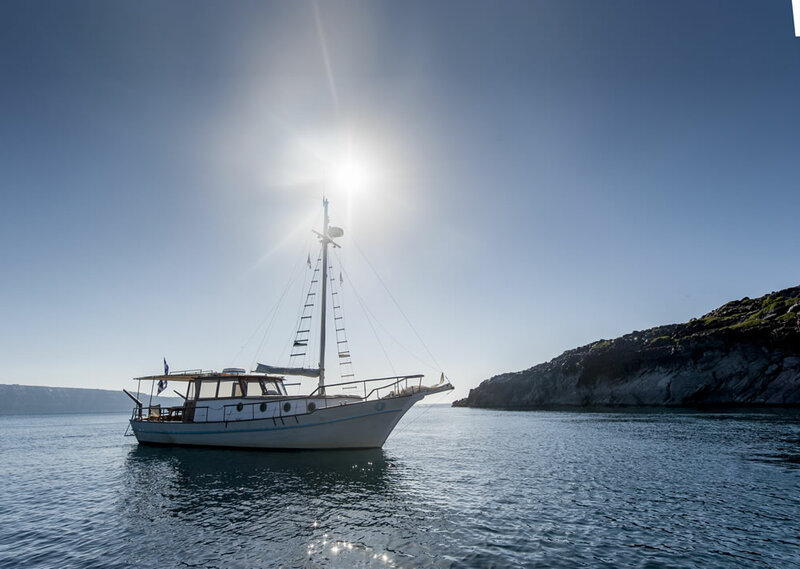 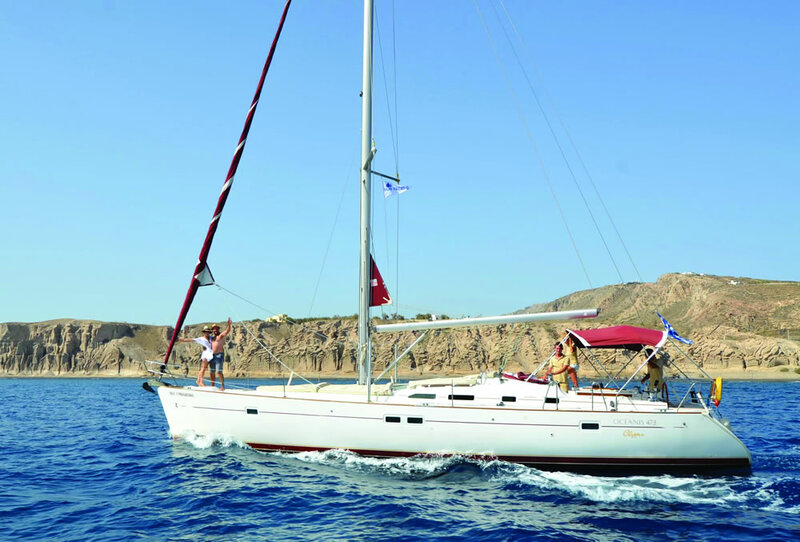 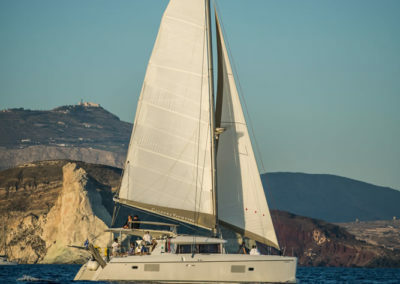 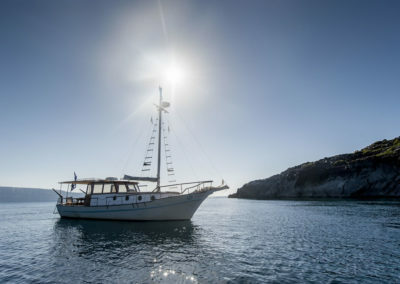 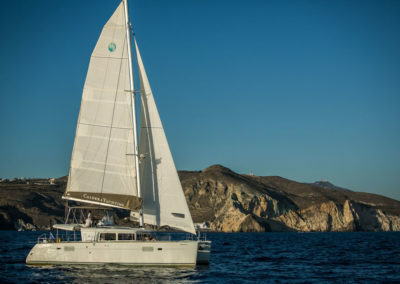 Our Day Cruise offers you a unique chance to admire Santorini’s beauty, sailing along the deep blue waters of the island, starting from the Red Beach for a swim, followed with a sail to the White Beach, the Black Mountain and the big Light House south of the Caldera, as we head to the Hot Springs. 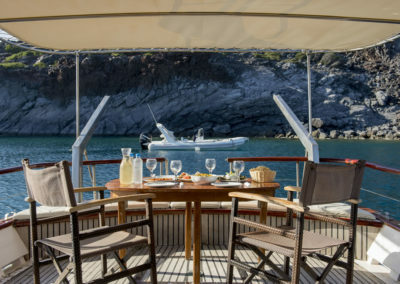 When anchored, a delicious lunch is served onboard with wine and dessert . 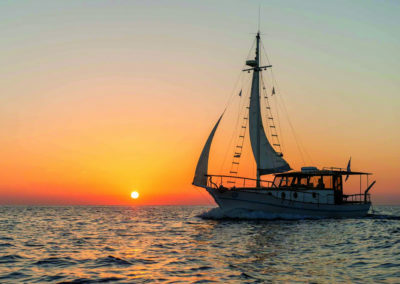 The Sunset Cruise will exploit your senses, not only from the imposing beauty of the Caldera, while sailing the sea route from Red Beach, the White Beach, the Black Mountain and the Hot Springs, but also because of the impressive beauty and spectacular colors of sunset. As the night falls, a sumptuous dinner is served completed with wine and dessert while admiring the shimmering stars in the sky and the twinkling lights on the island by night! 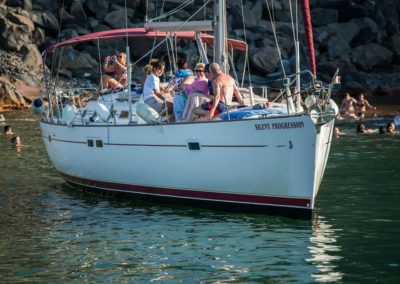 Our Day Cruise starts with sailing along our beautiful coastline, swimming at the Red Beach and admiring the black and red rocky background, the White Beach, and the big Light House. 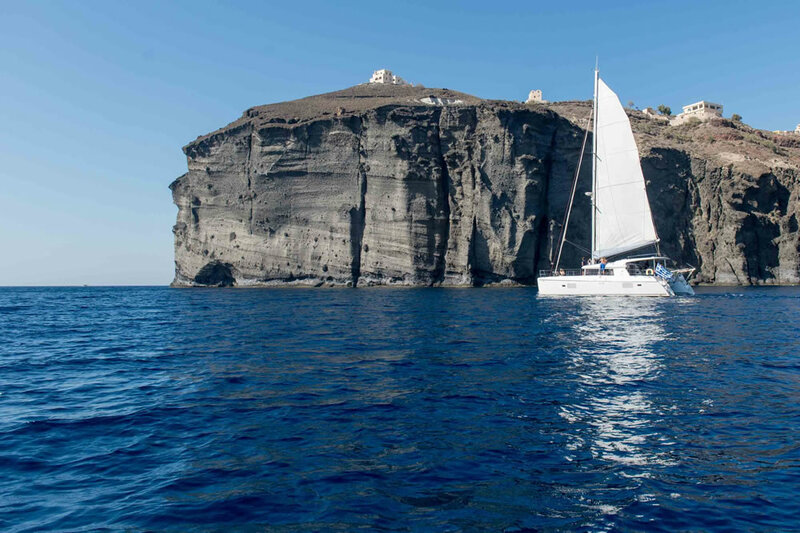 Enchanted by the imposing beauty of the Volcano, one of the most famous sceneries of the world stands lofty in the middle of the Caldera. 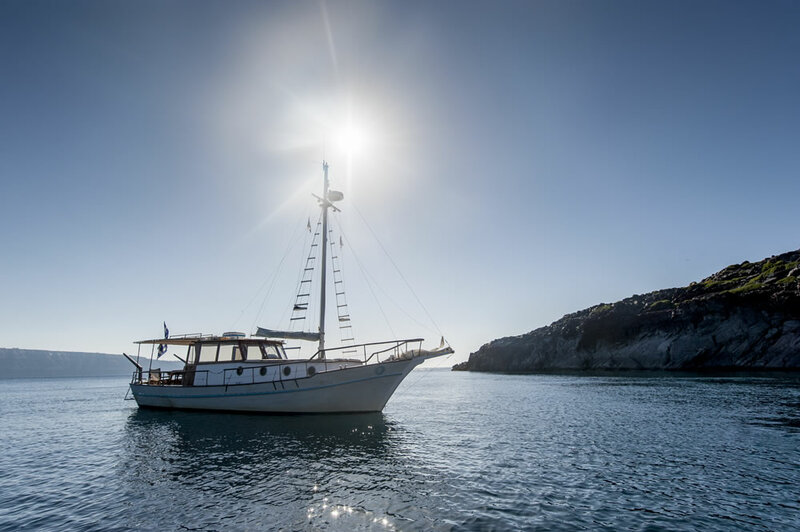 Swim at the Hot Springs, the warm volcanic waters with the therapeutic properties and feel the vibrant essence of the sea awaken your body and soul. 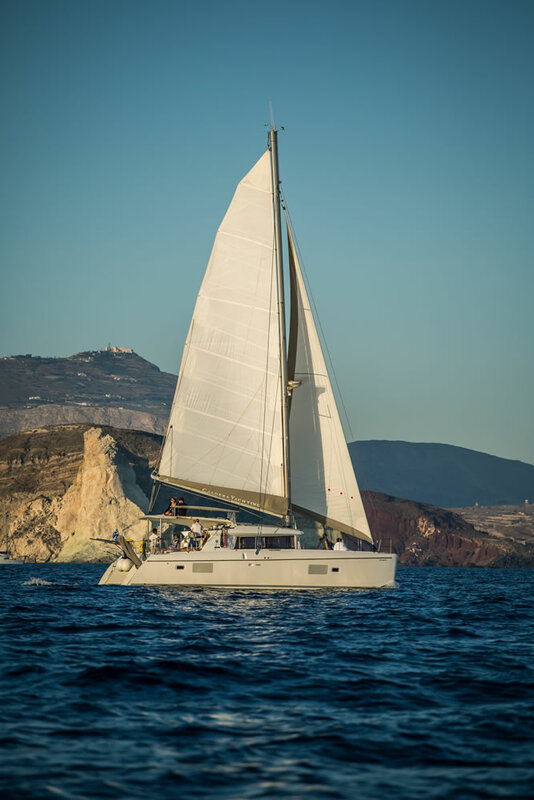 We will sail along coastline to see Fira village and old port, Imerovigli village, the famous rock Skaros, the monastery of Epta Paides and the old port Armeni. After we debark from the picturesque port of Ammoudi, you can choose to stay at the village of Oia to explore this unique place and admire the most famous sunset in the world! 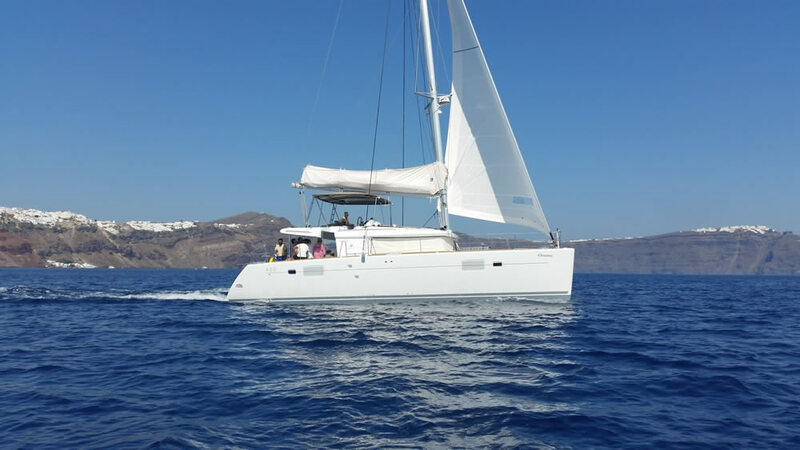 Cruise Time Schedule: 10.30-15.30 from Ammoudi port or 21.30 from center of Oia. 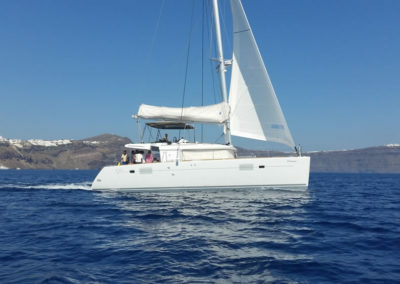 A Day Cruise will give you the opportunity to experience the exhilarating feeling of crisp winds and unique deep blue waters of Santorini. 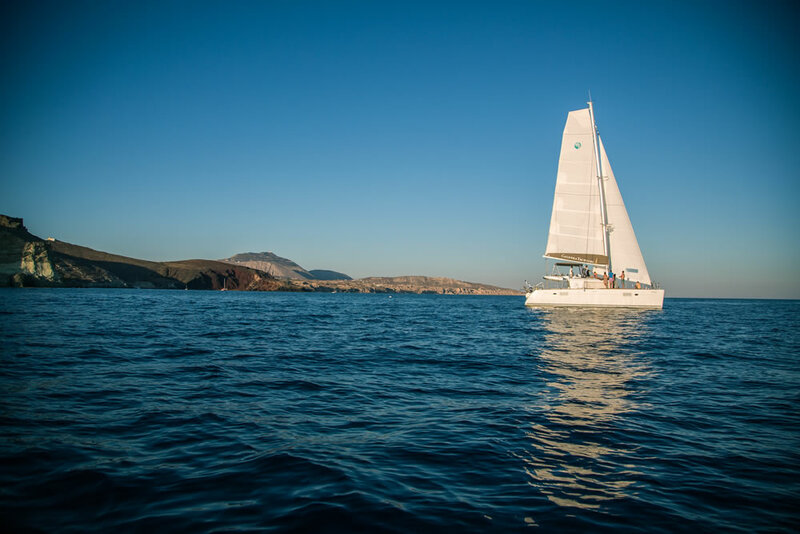 The first point of call is the Red Beach, enjoying a refreshing swim, followed by a pleasant sail along the White Beach and the Big Light House on the South of Caldera. 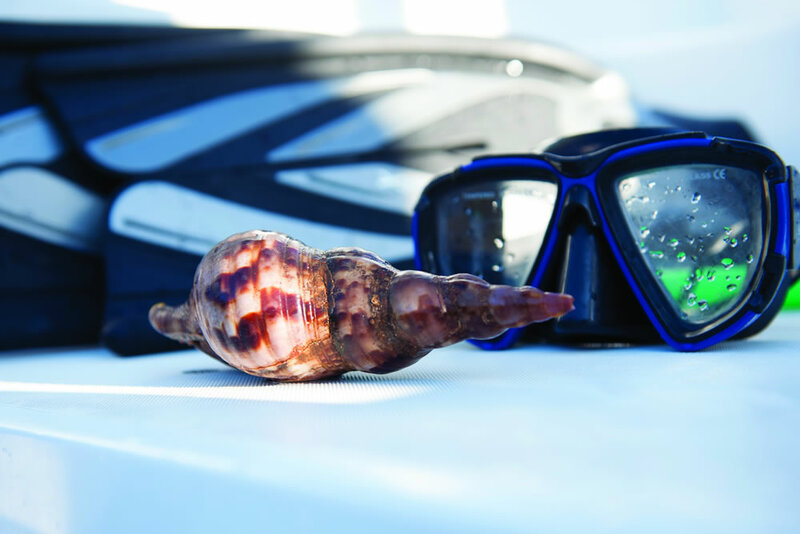 The unique volcanic beaches with their brilliant colours and the Hot Springs will exploit your senses. 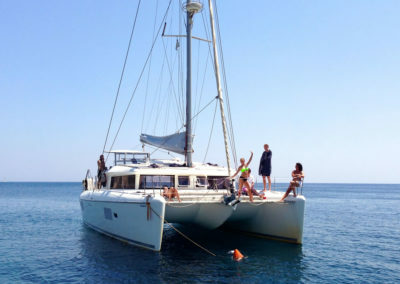 Our last stop is in fisherman’s island Thirassia for swim. 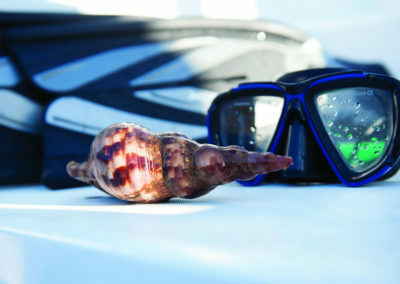 Snorkeling gear will be provided to enrich your experience. 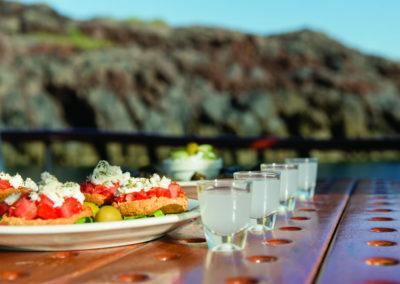 Our Sunset Cruise reveals the uniqueness of Santorini, offering you the ideal choice to experience a real moment of truth. 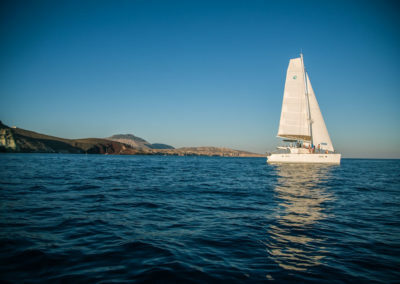 We sail along the Red Beach for a swim, the White Beach, the Big Light House and the Hot Springs around the Volcano, to admire the imposing beauty of the Caldera. 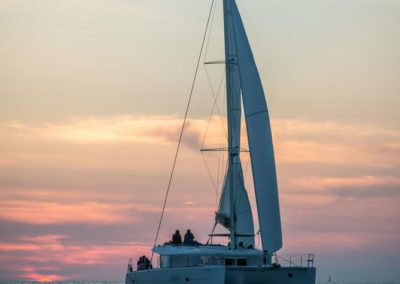 You will be left breathless as the unique colors of the world’s famous Santorinean sunset unravel. 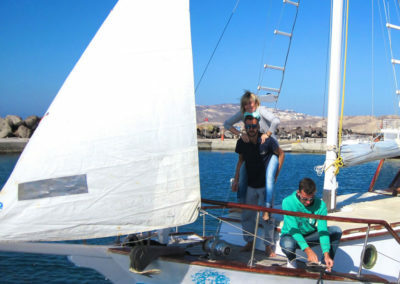 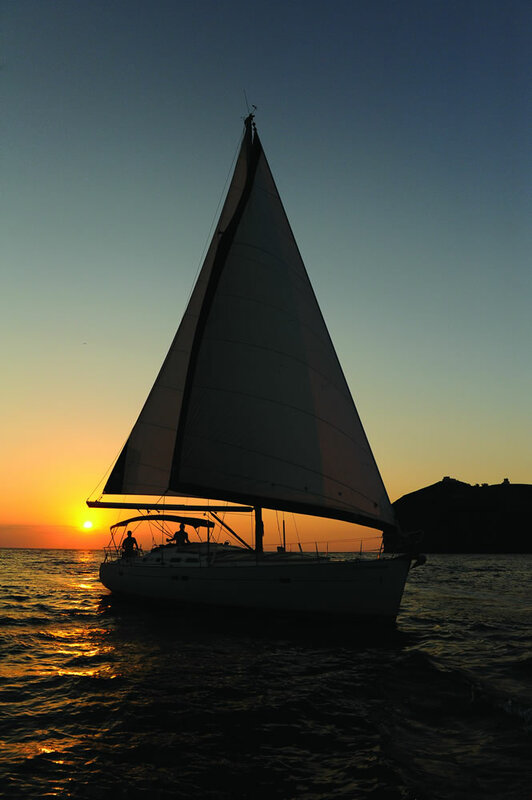 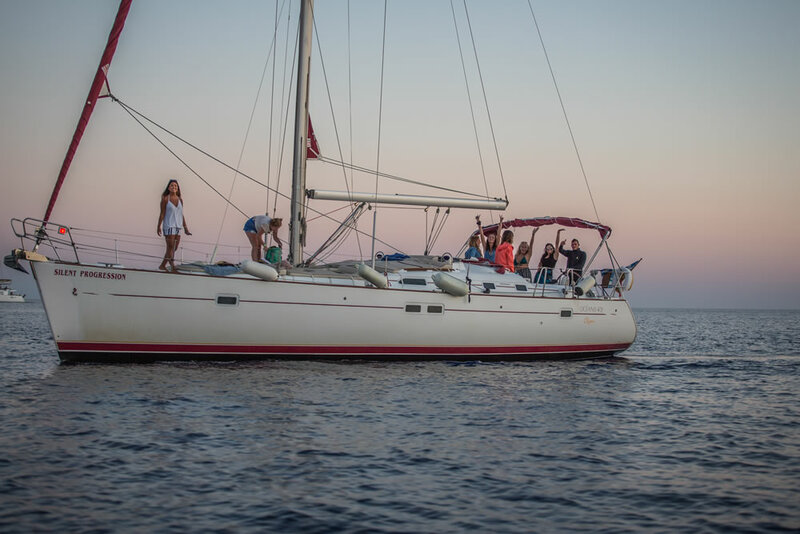 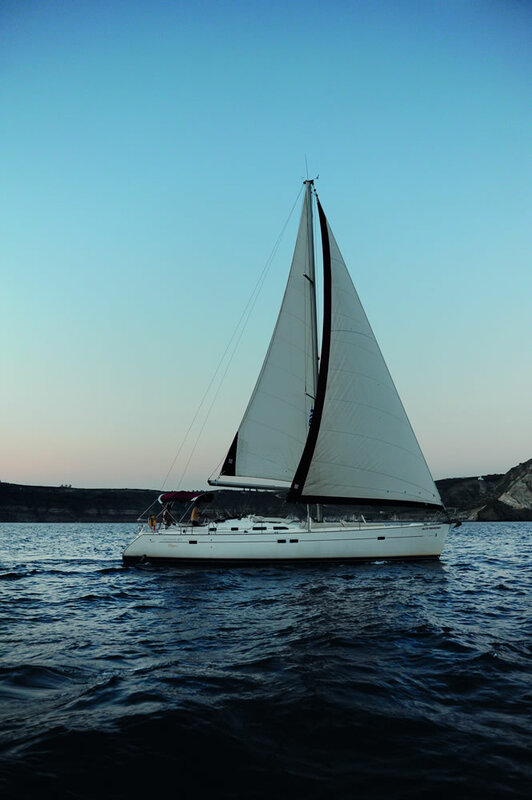 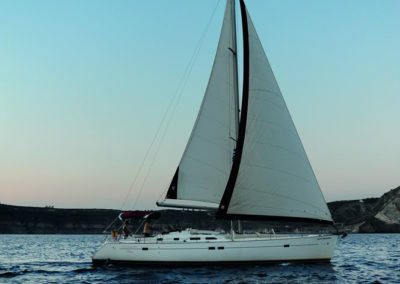 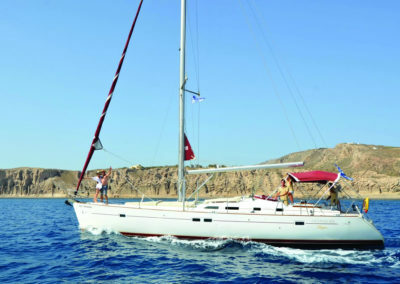 BOOK YOUR IDEAL YACHTING TOUR NOW!